Today the new EU Regional Economic Report from the World Bank together with its background paper came out which I have co-authored. The report and paper focus on how to increase EU growth. The EU’s growth record has been sluggish, which is particularly due to its low productivity. And productivity is today’s engine of the EU’s economy. How to revive this productivity? One big answer the report provides is through services reform, particularly in Eastern European countries. I agree, but would also look at Germany and France. Three focus points that arise from the report are important in this regard. First, reforming services markets any further is important. Of course, this can be done by lowering burdensome services regulations through, for instance, abolishing state interventions so that new services firms can have easier access to the market. However, a particularly striking feature that we find is that eliminating entry barriers is not sufficient. On the contrary, regulations on how firms operate appear to be a particular negative factor for EU productivity. These regulations include administrative rules on the form of businesses, rules on inter-professional cooperation in professional services or even rules on regulatory transparency among many others. Second, the report also emphasizes that EU countries’ domestic institutions matter. What do we mean by that? Various items such as a lower level of corruption, a stronger judicial system that enforces business contracts when things go wrong or just the quality of regulations implemented by qualified and competent market regulators. With these institutions in place, some European countries would gain a lot more from liberalizing services markets. This can be seen in the figure below. Source: Author’s calculations; horizontal line reflects percentage changes in productivity (TFP) levels in 2013. On the whole, countries that gain a lot from lowering regulations in services markets are in fact some of the Eastern European countries as shown by the blue bars. That is no surprise as these countries have lower productivity levels to start with and services regulations in some of these countries are still high. Hence, the greatest bang for the buck would be realized there from reforming. Other countries have already reformed a lot such as Denmark, Finland or the Netherlands. Reforming any further would still give productivity gains, but to a lower extent. 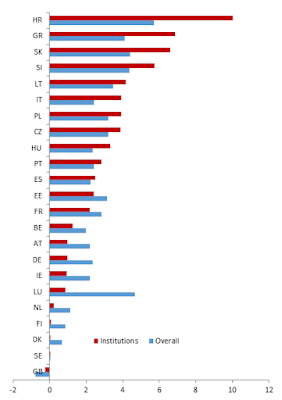 But, the figure also shows that if Eastern European countries (and others) had better institutions in place, their productivity would be much higher as seen by the red bars. Conversely, if Denmark hadn’t developed good functioning institutions, its productivity would have been lower. The point is that good institutions are important for productivity dividends to be realized when reforming services markets. Third, reforming in professional markets would be particularly rewarding. These include accountants, lawyers, architects or engineers. Benefits from reforming professional services would accrue to all EU countries, but let’s focus on those countries which already have strong institutions in place. The figure below shows two panels for productivity growth as opposed to levels that was presented in previous bar chart. The reason is because ultimately, this is what matters most to push for further economic growth. The left-hand panel shows realized productivity growth for countries with strong institutions, but who still have high professional services regulations in place. They include countries such as Germany, France, Austria or even Belgium and Luxembourg. Lowering regulations (albeit at small changes) results in some productivity gains, but not much. On the other hand, the right-hand panel shows the reform efforts implemented by countries that also have strong institutions, but have reformed whilst already having lower services regulations in place. These countries are for instance Netherlands, Sweden, Denmark or Estonia. Their productivity pay-off for growth has been considerably higher compared to the first group of countries. The bottom line here is that some countries are actually ready to realize greater growth benefits from services because of their strong institutions, but all that is holding them back is a lack of reform in services themselves. Source: Author’s calculations; World Bank; productivity growth is TFP percentage changes computed over 2006-2013. In sum, several conclusions can be derived for EU growth. One is to focus on services. Second is to focus on regulatory reform in services, particularly in professional services that will push EU growth further. Third is to focus on countries with weak institutions since a lot of potential growth from services reform can still be realized from this part of Europe. Fourth, focus on countries with stronger institutions, but still have higher professional services regulations in place such as France, Germany or Austria. Here too, potentially greater EU growth could come from here provided that these latter countries are willing to unlock their service sectors further.